Note: For all map points of nameds in The Well (for "well.txt" map files), see this quest entry. 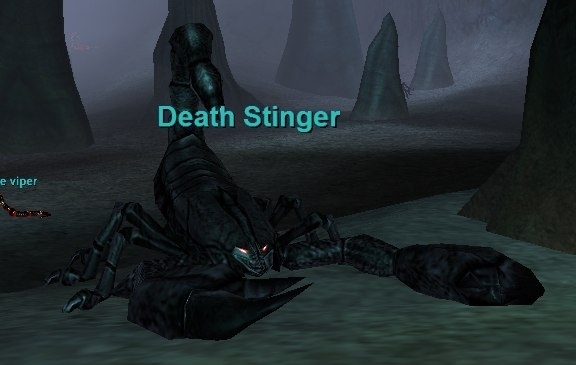 Death Stinger is known to spawn in the far eastern cavern (multiple spawn points; some roaming, some static). It hits for a max ~7,300. This page last modified 2018-01-10 06:33:39. Poped in two spots for me. /LOC -354, -710 & -488, -710. Dropped the Recondite legs and wrist today. These need to be updated on the loot table. Mob has approx 670K hps. Max hit on me was just over 7K. Dropped the shroud and a Median (88) fragment). friend spawned this. waited for me to come and get hunter kill. after it died, waited around for repop. got location from ph. ( n355 x n710 x p12). not far drom Dtaemi ( which is where we pulled it to).